Corporate social responsibility at Target is about improving people’s lives and making a sustainable difference in the world, all while fueling Target’s growth. Target engaged Cone to collaborate on a corporate social responsibility (CSR) report to tell the story of its sustainability and community commitments in an engaging way. At a time when CSR reporting has become commonplace for responsible companies, this report was designed to be differentiating and authentic to the Target brand. 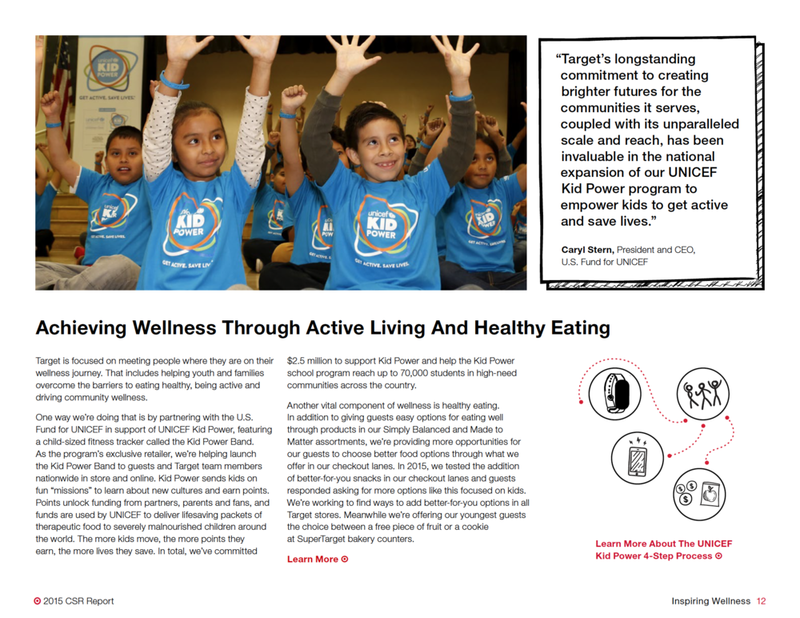 As such, Cone and Target developed a report rich with visual storytelling and credible content, focusing on Target’s new health and wellness strategy. Services included strategy, stakeholder engagement, content development and design for a 45-page report, 4-page summary and infographics for social media and Target headquarters’ digital wall. Within the first month after the 2015 report went live on Target.com, it received more than five times the unique page views, and over double the number of downloads, than the 2014 report. Average online visit duration was impressive, with higher than industry standard time spent viewing, and viewers moving between multiple pages of the report.